Product prices and availability are accurate as of 2019-04-20 05:33:41 EDT and are subject to change. Any price and availability information displayed on http://www.amazon.com/ at the time of purchase will apply to the purchase of this product. Weatherproof outdoor security camera, detects activity in 1080p full HD and sends notifications to your Nest smartphone app. Extra wide 130-degree viewing angle, capture all the action. Guards your home 24/7 with night vision, recording and streaming live footage up to 30-metres away. Detects motion and suspicious sounds and alerts you straight away using the Nest smartphone and tablet app. Built-in speakers and microphone to communicate with suspicious visitors. Mains powered so dead batteries will never be a problem. Share access to other family members so they can keep an eye on your home as well Simple DIY installation. What features does the Nest Outdoor Cam have? 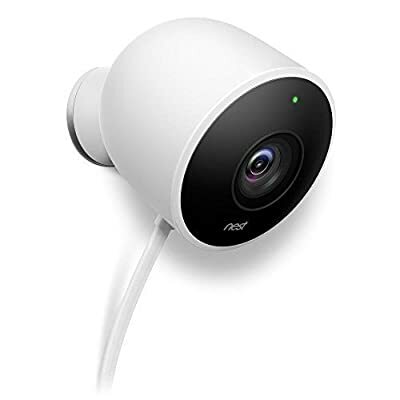 The Nest Outdoor Cam helps protect your home 24 hours a day, by keeping you up to date with live activity notifications on your smartphone or tablet. So you will find out about a break-in before it even happens. Capturing and streaming live footage in 1080p full HD, with an all-glass lens which allows you to get a true 1080p HD image quality compared to other outdoor cameras which have a plastic lens which actually lowers the quality you receive.